You will start building the fuselage by putting together several substructure assemblies, later you will put the assemblies together to complete the bottom ¾ of the fuselage. Let’s get started! Working with stainless steel is a little different than working with aluminum. 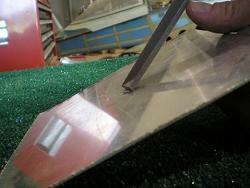 It seems the edges get a lot sharper and will cut you a lot easier than aluminum. Spend some time right at the beginning dressing the edges so you don’t get cut while doing the rest of the work. As your drill bits get dull, they will leave larger burrs on the backside of the stainless steel you are drilling through. The easiest way I have found to remove larger burrs is to use the flat end of a file like a chisel. Place the file end against the burr and give it a smack with a hammer. It will cleanly break off the burr. Then you can follow up with a deburring tool, scotchbrite wheel or emery cloth. If you are going to install the ground adjustable rudder pedals, there are two rivets that need to be changed from the plan. OP-3, the ground adjustable rudder pedal plans, show that each rivet just inboard of the F-801H on both sides needs to be an AN426AD4-5 with the flush head on the inside of the fuselage instead of the AN470AD4-6 rivet shown in the callout. 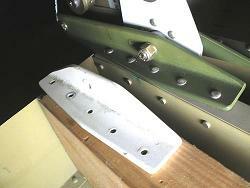 This allows the rudder pedal attachment angle to sit flush on the floor. It is a lot easier to countersink now. 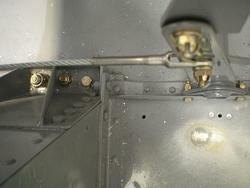 These rivets will be installed when you rivet on the bottom skin. Make a note in the RV-8 FORWARD FUSELAGE SUBSTRUCTURE section of your plans on the step that reads “Rivet the (AN470 rivet locations only) Firewall Assembly to the Fwd Floor Assembly…” I had to drill mine out when I got to the rudder pedals. Before your rivet all the parts together, drill any holes you may need in the gearbox. I had to drill holes for the fuel lines and electric wires in the F-802-As and Bs. The new “-1” parts may already have these holes drilled for you. See My Wire Routing for pictures. I have seen several builders make a large access panel in the F-866A Fwd Baggage Bulkhead, giving them easy access to the back of the instrument panel. I didn’t do this, but after spending a few hours on my back installing the electrical system, I think next time I have to pull the panel, I will make this access panel. If you are going to install an access panel, do it now while you can work flat on the bench. If you cut carefully, you can reuse the piece you removed as the panel itself. If it gets messed up, or won’t hold it’s shape, get a new piece of aluminum that is thick enough to hold it’s shape—as long as it is at least the thickness of the original F-866A (.025). You will also need a doubler (at least .025) around the top of the hole you made—the hinge and lap joint with the F-866B will be strong enough for the bottom. 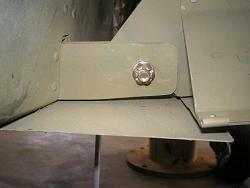 Make it straddle the hole so you can rivet it to the F-866A and have the access panel screw to it. Use a long piano hinge across the bottom and five screws over the top. In the older kit, we had to shape the ends of the F-806C&D. If this is still the case, round the corners only. Wait for filing of the bottoms until the wings are fitted, and the rear attachment hole is marked. The measurements there are critical, and if you have removed too much metal, you may be in trouble. This is one of the only big warnings in the plans, but it isn’t mentioned until you are fitting the wings. Don’t forget to fit the trim and autopilot brackets before riveting the substructure assembly together. If you fit them now, you will be able to use real rivets to hold them instead of blind rivets if they are installed after the fuselage is built. Make sure you bend the edge of the skins before you dimple. See Skin Lap Joints. My secret tool for twisting the longerons was a huge crescent wrench. Don’t ask where I got it, because I don’t remember, but it is a 24 inch crescent wrench. I set the jaws just wide enough to slip onto the longeron, and used it to provide enough leverage to twist the longeron and the smooth jaws didn’t mark up the softer aluminum. By placing the longeron in the vice at the spot where the bend started, and putting the wrench at the other end of where the twist stopped, I got a nice, gradual twist in the part. The distances and degrees marked on the plans are not always easy to measure. Bend them as close to the measurements as you can—you will get a final fit by comparing them to the parts they will match up to during the Forward Fuselage Substructure section. Check that you have opened the 90° angle the needed amount by using the weldments that the forward ends of the longerons will fit over. Once they fit nicely to both weldment webs without any gaps, the angles are good. I didn’t want to get bend lines in my curved F-804H-L&R, so I bent them over my knee. It worked just fine as they aren’t that thick. But I couldn’t bend the F-848 gussets that way, I had to bend them against the edge of the bench. I made sure to use the curved wooden edge of the bench to bend against. At least it minimized the angles in the curve. Make sure to mark the four F-8456 gussets not only with the part number, but also with their orientation when clecoed into the substructure. They look a lot alike, and can be easily reversed, swapped or installed upside down. My marks washed off during priming, and I had a hard time getting them all back in the right place. After you have clecoed the F-804 Center Section Assembly to the Forward Fuselage Substructure, you will install the F-843-L&R lower longerons. This is the time that I mentioned earlier where you can ensure they fit properly. You will have to cleco and clamp, check for fit, then remove and re-bend the longeron. Then start over again clecoing and clamping. This is a slow process, but it is important to have the parts fit correctly. Any space between the longeron and another part will either pull the thinner part out of shape, leave space between parts causing the structure to be weak, or put stress on a part possibly causing it to fail. Bending the roll in the F-823 skins is accomplished very similarly to the way you rolled the leading edges of the control surfaces. (See Bending Leading Edges) Make sure as you bend and roll that you keep some downward pressure to prevent a crease. This is another spot where you have to bend, fit, re-clamp and bend again. I did most of the bending on the bench, and finished the last little bit by hand. I had one spot that just didn’t want to lay flat, so a little persuasion with a rubber mallet was called for. When I was ready to drill and rivet, I used a large strap clamp all the way around the fuselage to hold the curved sections tight to the bulkheads. A quick note on the F-635 bellcrank substructure assembly. 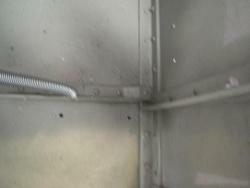 Before making, drilling and riveting the attachment brackets, decide on your autopilot. I built and installed, then had to drill out and remove the original mounts to allow for the larger mounts needed for my autopilot. If you haven’t decided yet, wait on these parts until after you do. The next several sections walk you through assembling the aft bulkheads, ribs and longerons. Then you finally cleco all the parts together, and the “Canoe” as my wife called it finally starts taking shape. It’s now time to work on the skins.